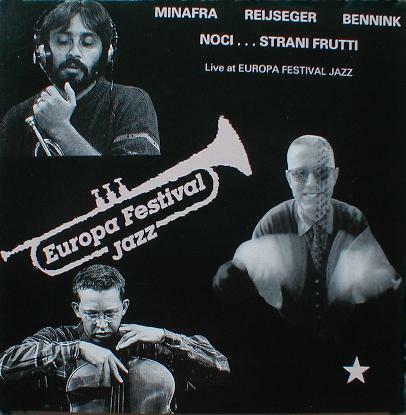 Live at Europa Festival Jazz. Pino Minafra - trumpet, voice, didjerido & other things. Ernst Reijseger - electric & acoustics cello, voice. Hann Bennink - drums, percussions, voice & other things. Recorded live 14th July, 1990 at the Festival of Noci in Pugia, Italy. "Talent and powerful sound exploding through a provocative and risky challenge full of intrigue not only for the audience but for themselves, their musical world and instruments. A tormented search for lost form, replaced by the changing and haunting flow of music and emotions. ... There are really very few wasted notes throughout this long improvised piece, composed through the memory, reflexions and artistic taste of three great musicians." Quote from the cover notes by Luigi Onori.